Takeaway: Oyster mushrooms not only enhance the taste of many dishes, but they are also good for our health. If you buy these specialty fungi on the market, they may very well cost you an arm and a leg, but have you ever thought about growing them in a cost-effective way yourself at home? The following article has all the information you need to give it a go. Oyster mushrooms are edible fungi that came from Germany, and since World War I have been planted all over the world as food. Their scientific name is Pleurotus Ostreatus. Oyster mushrooms prefer temperate and sub-tropical climates. It should come as no surprise that the number of people who are crazy for oyster mushrooms is dramatically increasing. After all, they so useful for cooking and have amazing health benefits. If you are unfamiliar with using oyster mushrooms in cooking, you can try substituting them for portobello or button mushrooms in pasta or meat dishes. They will also greatly enhance the taste of your soups. Regarding their nutritional benefits, oyster mushrooms are fat-free, cholesterol-free, and rich in various vitamins such as D, D3, D5, A, and more. Thanks to their high nutrient content, they help to maintain blood sugar levels, improve the immune system, reduce skin problems, and even promote a positive mood. For all these reasons, growing your own oyster mushrooms will not only give you all their nutritional benefits, but will save you a lot of money too. They are not expensive to grow, as they can be grown on a variety of different substances such as hardwood logs or wheat straw. You don't require a large amount of space or expensive tools, either. Straw: rice or wheat straw is acceptable. Scissors: to cut straw into smaller pieces. Water-tight containers such as buckets: to wash straw. Large cooking pot: to heat up straw. Plastic bags and a cord: to pack straw into. Spawn: this is available online and is used much like plant seeds in order to begin growth. You do, however, need to differentiate spawn from seeds as spawn requires a much greater level of hygiene than ordinary seeds. Water and sprayer bottle: to irrigate the bags and maintain room humidity. The most important thing to keep in mind is that all tools, materials, and even your hands must be sterilized to guarantee appropriate hygiene levels, or else all your work might be of no use because if the bags become contaminated, you will have to throw them away and start again. To reduce harmful microorganisms and keep beneficial bacteria alive, you must pasteurize the growing equipment used for oyster mushrooms. Of all the ways of pasteurization, boiling is probably the most cost-effective but it is time-consuming. To sterilize the straw that you are going to grow the mushrooms on, first cut it into 5-10 cm lengths (around 2-4 inches). Put the straw into your watertight containers, such as buckets, cover with water, and leave it to soak for 24 hours. Wash thoroughly and take it out of the water. Fill a large cooking pot with fresh water and heat it until the water reaches 70-75°C. Put in all the straw and keep it at boiling point for one hour. When this time is over, drain the water off and cool it down. Use this water bath method to sterilize any other equipment you are going to use for the growing process, such as your water spray bottle and knife for cutting the mushrooms off once they are grown. If you prefer, you may use other methods of sterilization such as chemicals or steam. As mentioned before, it is crucial you are also as clean as possible when dealing with the mushroom spawn. Wear clean clothes, wash your hands well, wear sterile gloves and a face mask. You will then be ready for the next step. Do not let the pasteurized straw from step 2 become too dry. It should still be slightly wet. Place it into the plastic bags. Sprinkle in some mushroom spawn and mix all up. Pack the bags quite tightly with the pasteurized straw. Tie the end with a rubber band. Make some small holes in the bag for air. All you need to do now is to leave these bags to incubate in your prepared room. 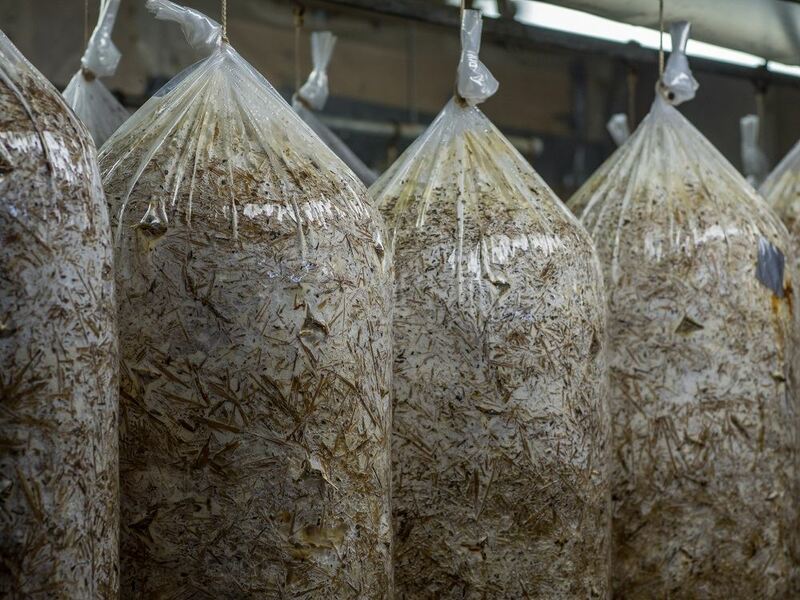 Which conditions are the most suitable for oyster mushroom development? You should place the bags in a shaded room without direct sunlight, where you are able to maintain the humidity levels and offer some fresh air. Be sure there are no insects in your growing room. Make sure to seal off all potential entrances such as holes or windows. The most suitable temperature for oyster mushrooms to develop in is between 10 and 24°C. Examine your bags from time to time to check for any dark spots of a green or brown color. These indicate infection and should be removed as soon as possible. In standard conditions such as these, the spawn should colonize the bags within three weeks. To encourage strong and healthy growth, you need to continue to provide high humidity levels and low light. From time to time, use your water sprayer bottle to maintain the moisture levels both in the room and in the bags. Make some larger holes along the bags for the mushrooms to grow out of. You should begin to see them taking shape within a couple of weeks. Your mushrooms are ready to harvest when their caps separate fully from their stems. Try not to pull them out with your hands, as you may damage them. Rather use a sharp (sterilized) knife to cut them off neatly. Be careful not to tear your bags as more mushrooms will develop. Remember to wash them before cooking. The first crop is usually more productive than any others later. When the spawn in the straw is exhausted and no more mushrooms are forming, make use of the straw for compost for your garden. In conclusion, oyster mushrooms are beneficial to your health and lots of fun to grow. To enjoy safe, healthy mushrooms right from home, just follow the six simple steps outlined above. Remember right through the whole process to pay attention to cleanliness, high humidity, and low light. You’re bound to have success if you do this!